Feeling Farsley's positive energy (arguably the 'best' Town Street?) | West Leeds Dispatch | News. Views. Get involved! 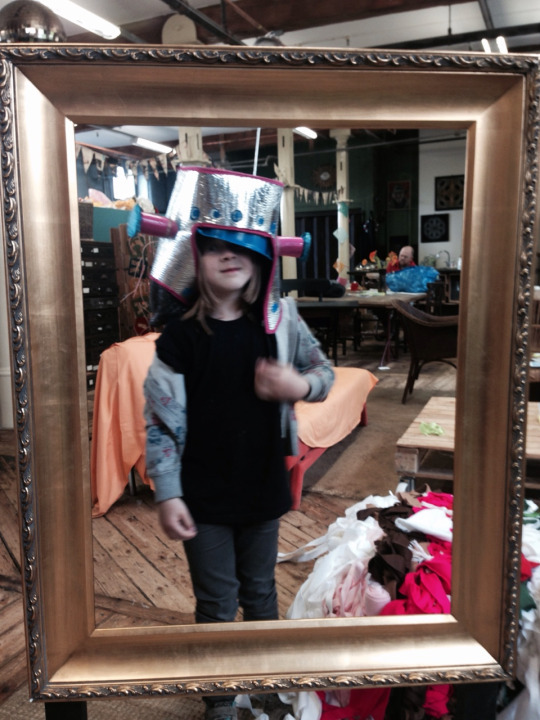 Took a trip Scrap Creative in Farsley yesterday with the children. We love it so much, such an overwhelmingly amazing experience which totally dazzles the senses. Scrap, a social enterprise, was started in 2007 by Louise Lucas and takes in waste products from businesses and encourages schools, early years groups, artists and members of the public to use their imaginations to create and conjure new worlds. Scrap has Scrap stores in schools across Leeds and advocates open ended play inspiring teachers and young people to take inspiration from a range of materials to create play adventures. Just over a year ago Scrap moved into Sunnybank Mills in Farsley from Kirkstall, and a huge floor is now filled to the brim with the most amazing visually stimulating stuff. Light floods in through the windows creating a sense of wonder and magic. My children delight in the dressing up box, the laid back ‘anything goes attitude’ and pour over the creations from previous workshops and tinkering. I filled a huge bag of stuff for our Playbox: paper, card, hessian sacks for sack races, modelling clay, and many more odds and ends I never knew I needed. I could have spent a day in there looking at the fabrics and other colourful materials. You’d be hard pressed to spend too much money and as somebody who doesn’t love shopping it’s as close as I get to enjoying the activity. Well done to Louise and her amazing team for making magic. Not only do they intercept waste from landfill they fill our creative souls with inspiration and recharge the imagination. Check out tinkering workshops, children’s activities, venue hire and more on their website. We also paid a visit to the fantastic Mill Kitchen, also within the Sunnybank Mills site. How lush and great value. Again it feels very welcoming, the toilets were judged by the children to be the nicest smelling ever! Farsley has a feel of being a place with lots of positive energy, it’s changed quite a bit since I used to take the children to Jackaboos soft play centre six years ago. I’ve heard really good things about the Gaunt Brothers who are re-developing their family owned Sunnybank Mills in a considered and community focussed way. The Mills has a very creative scene with art gallery space, Trouble At Mill monthly ‘pay what you feel’ theatre with a variety of independent small businesses locating there. I love peeking at the upholsterers workshop when I wander about. 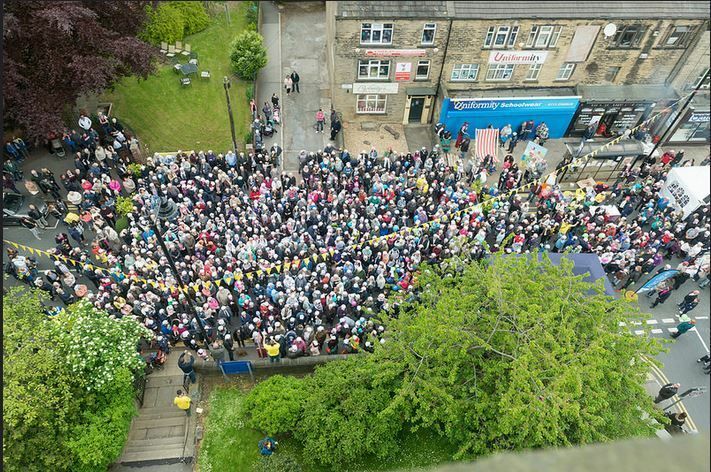 The volunteer-led Farsley Festival set a new world record last weekend for knotted hankie wearing and has grown year on year. Howard Bradley is one of the key instigators and has also been behind a regular Farmers Market and youth development activities over the last 10 years. It’s people who make community, and none of these things happen over night, years of graft, of gentle and sometimes not so gentle shaping & stirring go into making places. You can feel the positive atmosphere when you visit Farsley. What can I take from this when considering the fortunes of Armley? 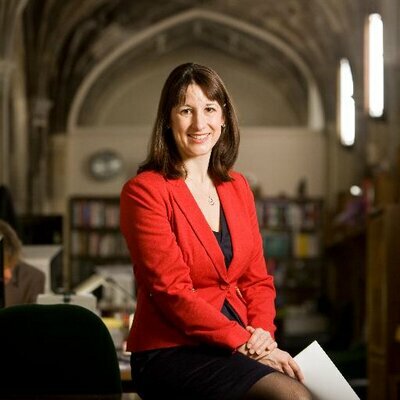 I certainly don’t think we should be aiming to compete on ‘best town street’ as Rachel Reeves MP for Leeds West has declared in this YEP clarion call. Maybe making statements like this are intended to galvanise, prod and provoke? Maybe it’s the politicians’ way to stimulate conversation in this way? I’m not sure, I want the best for Armley, but I’d also like to question what that actually means rather than assume everything is going to the dogs as certain recent articles in the newspaper would suggest. So I’m prepared to take part in conversations but less convinced by this typical form of polarising ‘consultation’. On the 11th June a group of us, including the brilliant Armley phenomenon Real Junk Food Project, are putting on the first of what we hope might be regular rotated events. We’re starting in Armley Conservative Club to bring together people doing good stuff in Armley. Totally aware this is potentially a contentious choice of venue but undeterred at this stage as I’m of the opinion community should transcend being divided down party political lines (and apparently nobody votes Tory at the club and the £7 annual fees aren’t propping up Cameron et al). We’ve already a fair few people interested in taking a free table to show off their stuff and we hope to start creating a map of all the great people, venues, activities, shops and stuff which makes Armley good! It’s a start! Right, I’m off to get my free hanging basket from the marvellous Armley Common Right Trust. A version of this article appeared on the Cultivate Ltd blog on Saturday, May 30, 2015. What do you think about Emma’s observations? Have your say in the comments below!